When you purchase a Celestron microscope, you're buying from a company with a solid reputation that's been around almost half a century. The company began in the 1950s as Valor Electronics. The founder, Tom Johnson, took an interest in telescopes when he started building one for his two sons. By the 60s Johnson had created the Celestron division, and started selling offering telescopes for sale. From these humble beginnings Celestron grew into one of the leading manufacturers of telescopes, binoculars, and microscopes. For years they've prided themselves in making high-quality products at an affordable cost. 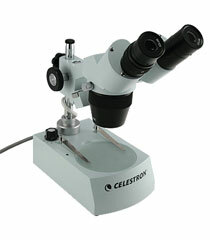 Celestron microscopes come in a variety of models with a range of costs and features. Whether you're a hobby scientist or clinical researcher, Celestron has a model for you. The Celestron microscope product line comes in three main types: biological, digital, and stereo. A biological microscope is used to study living organisms and their processes. If you're going to be observing blood, tissue, or specimens in a slide, you'll need a biological microscope. The most popular Celestron product in this category is the Celestron 44104 500x Power Advanced Biological Microscope. At under $200, it's a good value for an intermediate level microscope with a lot of features. The Celestron 44104 is well built and easy to use and focus, with high-quality optics that allow you to see objects very sharply. This makes the microscope enjoyable and accessible to both kids and adults. One thing people love about this Celestron microscope is the mechanical stage. It lets you move the slides without have to take them out and reposition them. This is a nice feature that makes using it a lot smoother. A digital microscope puts a spin on the traditional biological microscope. Instead of viewing slides through an eyepiece it uses a built-in camera to send a digital image to a monitor. As you can imagine, there are advantages and disadvantages to both types. One of the most popular models of this type is the Celestron LCD Digital Microscope 44341. This product has a 5 megapixel built in digital camera, which displays on the included LCD screen. At under $200, this is another good value for someone looking for a biological microscope with a digital display. The LCD screen on this model allows for comfortable and easy viewing. The built-in digital camera lets you take snapshots or even short videos, which can be stored on an SD card or moved to your computer. Some consumers have had complaints about the quality of the LCD screen, but this is still one of the best digital microscopes you can buy for the price. If you purchase from Celestron, you'll even get a two year warranty. A stereo, or dissecting, microscope provides a three-dimensional view of the specimen. It does this with separate objective lenses and eyepieces for each eye. Stereo microscopes have lower magnification when compared to compound microscopes, but they also have a longer working distance. The best selling Celestron microscope in this category is the Celestron 44202 Advanced Stereo Microscope. This microscope is designed to give an excellent view of 3D objects lit from above. This model retails for below $300, and is a great option for both educational and home use. The built in underneath and overhead lighting allow for a clear view at both the 20x and 40x magnification. This microscope wasn't made to look at flat objects on a slide, but rather specimens such as plants, insects, or hair. The longer working distance allows you to work on specimens while you're viewing them. Its sturdy construction and ease of use also make it a good choice for kids while the high-quality optics make it attractive for adults. Celestron microscopes generally receive very positive reviews. However, there are some complaints that crop up from consumers. For example, some users report that the electric illuminator on the Celestron 44104 gets hot and gives off a funny smell. Others state that the lighting and viewing quality isn't as good with higher magnifications on mid-level models. Thus it's important to read reviews of any product that you wish to buy and to know your needs. Many complaints result from the consumer not using the microscope for which it was intended. For example, some users are unhappy with the magnification of the Celestron 44202 when it comes to viewing flat slides. However, this is a stereo microscope and is meant more for three dimensional objects. So do your research and know what you want to do before you spend your money. That said, most consumers rate Celestron microscopes very highly, and the company has decades of experience and a reputation for high quality products. Most models on Amazon.com have an average rating of 4 or more stars. The Celestron 44102 400x Power Laboratory Biological Microscope is an entry-level product that still provides great magnification and features at an affordable price. The sturdy construction makes it a good kids starter microscope. This is a pared down version of the Celestron 44104 without the mechanical stage, Abbe Condenser, and a few eyepieces. The Celestron 44106 1000x Power Advanced Biological Microscope is also similar to the Celestron 44104, but with a few more features and higher magnification. It is also more expensive, making it appropriate for the more serious hobbyist. The Celestron 44108 1500x Power Professional Biological Microscope is a heavy-duty, professional model. It's over twice the price of models mentioned thus far, but with an increase in price comes an increase in optics quality. Yet it still remains easy to use in terms of the controls and changing slides. The Celestron 44110 1500x Power Professional Biological Microscope is a professional model known for its high-end components. The PLAN optics allow for a very flat field of view. This microscope uses Koehler illumination, which results in spreading light evenly for high resolution. At almost $1,000, this is currently the most high-end biological microscope you can buy from Celestron. The Celestron 44320 Microscope Digital Kit combines the best of both worlds. It can be used at a traditional biological microscope with magnification of up to 600x or you can use the included digital camera to view slides on a computer. This all-plastic model is not renowned for being sturdy, but at under $100 it does a lot for the price. The Celestron 44306 Handheld Digital Microscope does not use slides, instead you just hold it in your hand and point it at what you want magnified. It's a simple unit that still offers up to 200x magnification and the ability to take pictures. The Celestron 44302 Handheld Digital Microscope is similar to the 44306, only with slightly less impressive features, such as a digital camera with fewer mega pixels and 150x power. Best for those on a budget that want to examine things like coins, insects, etc. If it's more digital power you want at a price that won't break the bank, check out the Celestron 44330 Handheld Digital Microscope. This is a digital and optical unit that offers a lot of power and fun for the price. If you're looking for a more powerful stereo microscope Celestron also makes the Celestron 44206 Professional Stereo Zoom microscope. This model has higher magnification options and a larger field of view. At over twice the price of the Celestron 44202, it's more suited to the professional low power user.